*UPDATE*. : This promotions has expired. You can find latest TUI discount offers in this article. Booking sample of TUI Airways UK promo code: get £20 discount on all return flights! As per our booking sample you would depart from London Gatwick to Liberia, Costa Rica on 1st of October. Inbound flight from Central America back to the United Kingdom on 15th of October 2018. Take advantage of this rare deal and save further with charter airlines. 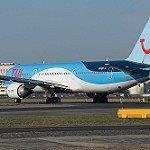 Use special TUI Airways discount code and fly cheaper to exotic holiday destinations..